There are three best mid-range smartphones are here with the potential features. Let us compare these three gadgets. They are nothing but Realme 2 Pro vs Mi A2 vs Honor 9N smartphones. If you are looking for Mi A2 vs Realme 2 Pro vs Honor 9N smartphones key features, technical specifications, price, review and comparison etc. then you would get some of the detail over here. Realme has launched Realme 2 Pro in September 2018, Xiaomi has launched Mi A2 in August 2018 and Huawei's Honor has launched Honor 9N latest version in July 2018. We can check their price first, Realme 2 Pro starts from INR 13990 for 4GB/64GB, Mi A2 starts from INR 16,999 for 4GB/64GB and Honor 9N starts from INR 11990 for 3GB/64GB and INR 13990 for 4GB/64GB variants. Honor 9N is powered by Kirin 659 processor, Mi A2 is powered by Qualcomm's SDM660 processor and Realme 2 Pro also comes with Qualcomm's SDM660 AIE processor. These all are almost same processor powered. Display of these gadgets. 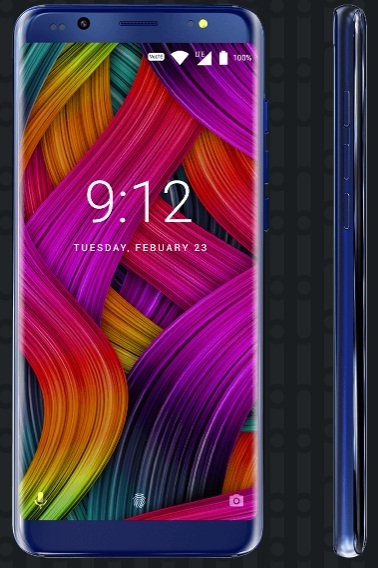 Honor 9N comes with 5.84 inches screen with Top-Notch design and 2280x1080 resolution, Mi A2 comes with 5.99 inches with Full-View FHD+ screen and 2160x1080 resolution whereas Realme 2 Pro comes with 6.3 inches FHD+ Dewdrop and 91% screen-body ratio. Let us go with these three smartphones' camera detail. Honor 9N comes with 13+2 megapixel rear camera and 16MP front shooter. Mi A2 comes with 12+20 megapixel dual rear camera and 20MP front shooter or selfie purpose whereas Realme 2 Pro comes with 16+2 megapixel dual rear camera and 16MP selfie cams. Mi A2 has some extra power here. However, all these phones have best low-light cameras. The dimension of these gadgets as follow. Realme 2 Pro with 156.7x74.0x8.5mm, Mi A2 with 158.7x75.4x7.3 and Honor 9N with 149.2×71.8 × 7.7. The weight comes as follows, Honor 9N weighs 152g, Mi A2 weighs 168g and Realme 2 Pro weighs 174g. You can understand which one is less weight among. Let us check on the final things, yes, battery on these devices. Honor 9N is powered by 3000mAh battery, Mi A2 is powered by 3010mAh battery and Realme 2 Pro is powered by 3500mAh battery. So, Realme device goes better here. Android 8.1 Oreo operating system in these three mobile phones but Android One additional in Mi A2. All these phones coming with 4GB/64GB variant in general beside other variants. All of them comes in different colors but in general all of them have Black, Blue colors too. Almost many details have been covered and possibly few missing which we would cover them at later stage. Please note, all these comparison done based on official specifications and features given. Hands-on comparison on speed test, battery test, camera test etc. might differ from these comparison. Tips: All these three best smartphones are really awesome to go with. You can decide as per your choice. Nuu is a brand from the US and has released couple of series of smartphones including A, X, M and G series etc. The brand has recently released Nuu G3 Android smartphone with MediaTek processor with budget price. If you are looking for Nuu G3 phone's key features, technical specification, price, review, first impression, hands-on and comparison etc. then you would find some of them over here. The phone is powered by MediaTek Helio P25 Octa core 2.39GHz speed processor and paired with 4GB of RAM. The smartphone comes with 64GB of internal storage which the memory can be expandable up to 128GB through microSD card. The Nuu G3 runs with the latest Android Nougat / Oreo operating system and the display of the phone is of 5.7 inches HD+. The gadget comes with potential features and pretty design to carry around. This is one of the cheap and best high-end smartphone to grab it. You can check Nuu G3 smartphone specs and price detail below. Tips: The brand announced that it has some discount and SIM / data offers. Xiaomi India has unveiled the latest range of Mi LED Smart TV with the above subject models. The brand has introduced MiTV 4C Pro 32 inches, MiTV 4 Pro 55 inches and MiTV 4A Pro 49 inches with the brand slogan of SmarterLiving. Xiaomi has also launched Mi AirPurifier 2S, Mi Home Security Camera and Mi Band 3 with the best features and at very reasonable and competitive prices. Xiaomi has also announced that they are going to update the new PatchWall soon for earlier TVs and the update includes all new feature additions and services. If you are interested to know the latest MiTV 4C Pro 32, MiTV 4 Pro 55 and MiTV 4A Pro 49 key features, technical specification, price, review and comparison etc. then you could find some them over here. By the way, Xiaomi has earlier launched Mi LED smart TV 4A 32 inches with reasonable price and features. The all-new MiTV comes with the 7th Gen flagship Amlogic 64 bit Quad core processor. They are coupled with ARM Mali 450 GPU, up to 750MHz. All these Mi TVs equipped with 3 HDMI ports and 2 USB ports. MiTV4CPro comes with a headphone jack. They are the cheap and best TVs (Televisions) at the moment compare to other brands' similar features TVs. The starting price of Mi LED TV 4C Pro, 32 inches is at INR 14,999 and this has potential features well. Please note, the sale of these TVs are going to begin on October 9th, 2018, 9PM onward at Mi store and Amazon. So, don't miss the chances and offers. Tips: As per comparison with other brands similar features TV, Mi TV stands as cheap and best price gadgets. Best time to grab one at least. Vivo has launched Vivo V9 Pro smartphone after its earlier V9 and V9 Youth series smartphones. The phone comes with the latest features and top-notch display. The Vivo brand has also recently released Vivo V11 and V11 Pro with DewDrop Notch design and high-end features for INR 25990. The similar design phones are already releasing one by one by few other brand as well. If you are looking for Vivo V9 Pro key features, technical specifications, price, review, first impression, hands-on review and comparison etc. then you would find some of them over here. The phone is powered by Qualcomm's Snapdragon hexa-core processor and paired with 6GB of RAM. The device also comes with 64GB of internal storage with an expandable option via microSD card. 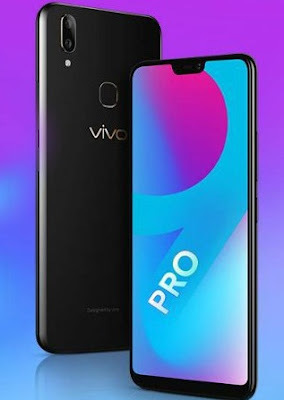 The Vivo V9 Pro smartphone runs with the latest Android Oreo operating system and ready for Pie OS as well. This is top-notch design and 6.3 inches display device. The gadget comes with 13+2 megapixel rear camera and 16 megapixel front shooter for the best result of the photos and videos from its sensors. This could be one of the best smartphones, best selling smartphones and possibly one can get the discount offer as well. You can check V9 Pro specs and price detail below. Vivo V9 Pro price: INR 19,990 (and discount offer will come soon). Tips: One of the best smartphones to grab it. You may get discount on this phone when festival offers to come soon. There are four well known budget smartphones recently launched, the respective brands has released with more or less similar specs, features and prices little differently. 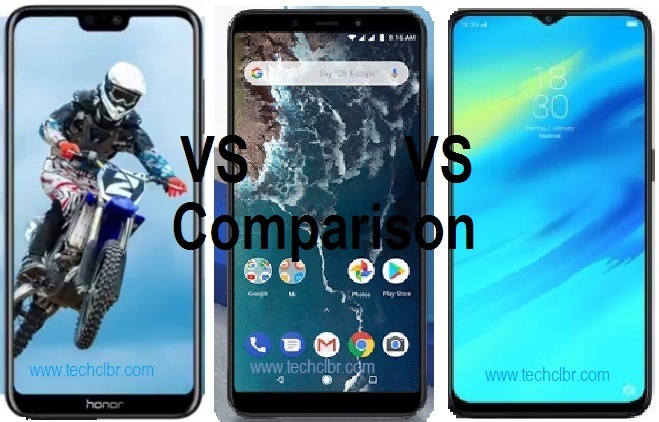 Though there are many smartphones more than above mentioned subject devices available in the market with somewhat similar features and prices, but let us compare these four smartphones first to learn something out of them and we would cover, compare and review other brand mobile phones too, later. Why Oppo A3s vs Realme 2 vs Honor 7S vs Realme C1 comparison? As far as we could remember, Oppo is one of the first brand that released Oppo A3s smartphone with Top-Notch design in a cheaper price at that time when compare among. Later, few other brands too released with the Top-Notch display phones with almost similar features but little extra prices. Very few brand released similar pattern phones and just full-view models with the lower prices as well later. All these phones are budget smartphones for sure. If you are looking for a cheap and best smartphones then you can grab one of them. Let us compare the above subject phones leaving other devices at the moment. The Oppo A3s released for INR 11K on 2GB+16GB variant, Realme 2 released for INR 8990 but 3GB/32GB storage which is better when compare. Both are Top-Notch pattern devices. The next came out, Honor 7S for INR 6999/=* with 2GB+16GB variant which is really a competitive and killing offers from Huawei's Honor brand. The phone is not of Top-Notch model but it is okay with specs and Full-View display. Realme has right now launched Realme C1 for INR 6999/=* (2GB+16GB variant) with Top-Notch design almost similar specs and features in it. This is a competition to its own Realme 2 as well. All these four smartphones have slight changes in specifications and in-depth features and have nothing less or more features among. All runs with the latest Android Oreo operating system and have some common 4G features. In these four devices, Honor 7S only have slight changes and they are MediaTek MT6739 1.5GHz Quad-Core processor compare to other three Qualcomm SD450 1.8GHz processors. Honor 7S phone comes with 5.45 inches normal display compare to other three of those comes with 6.2 inches Top-Notch designs. Honor 7s comes with 3020 mAh battery whereas other three gadgets powered by 4230mAh mega battery that is a good news. You can also check Realme 2 vs Oppo A3s comparison that we earlier published. You can also check other smartphones comparison herewith. There are some more features between these mobile phones which we have not yet covered them and would cover at a later stage, like fingerprint sensor, camera and Glass differences. You can check these smartphones key features, technical specifications, prices and comparisons so that you can know something out of them. Please note, 2GB RAM is okay for speed but 16GB ROM in these smartphones might give you trouble in the future for internal storage issues unless it works well with external microSD card of 64/128/256GB storage. Tips: They are pocket friendly smartphones and you can choose any of them or all. 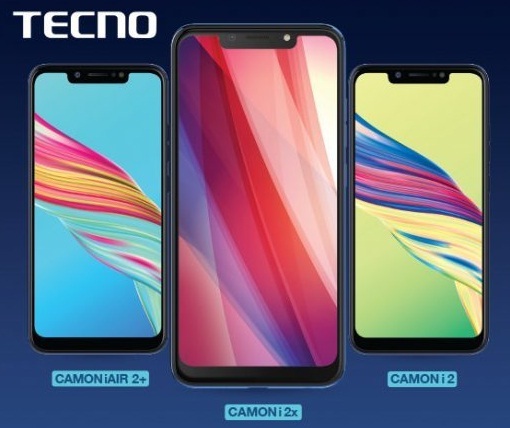 Transsion India has launched Tecno Camon AI series three smartphones recently. They are Camon iAir2, Camon i2 and Camon i2x smartphones with potential features including Top-Notch display. The brand has three different sub-brands viz. Infinix, iTel and Tecno and they are releasing mobile phones in a different countries including Africa and other parts of Asia. If you are looking for Camon iAir2, Camon i2 and Camon i2x smartphones' key features, technical specifications, price, review, hands-on and comparison etc. then you would find some of them, below. All these three phones are powerd by MediaTek A22, A22 and P22 2.0GHz speed processor and paired with 2GB, 3GB and 4GB of RAM respectively. The internal storage of these gadgets are 32GB, 32GB and 64GB ranges. Camon iAir2, Camon i2 and Camon i2x are runnig with the latest Android Oreo operating system along with custom UI skin of HiOS from the brand. All of them are Top-Notch designed and beautiful smartphones. These phones are coming with AI Face Unlock and Fingerprint sensor. You can see the different megapixel of Camera from each one of them. 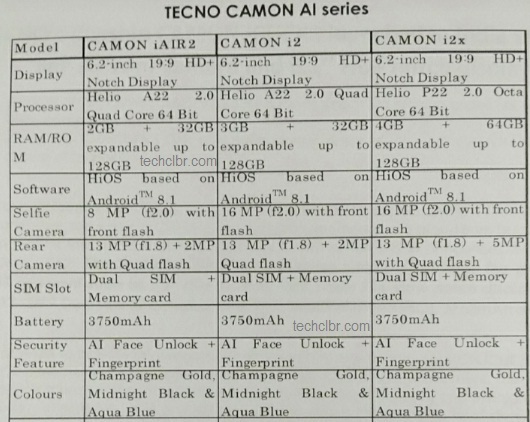 You can check other features and differences of the Camon iAir2, Camon i2 and Camon i2x smartphones herein below. Tips: One of the cheap and best smartphones to go with. As you are aware Realme has just launched the Realme 2 Pro smartphone with surprising and killing prize starts of INR 13990. During launch, Realme CEO, Madhav Sheth also announced another one budget smartphone and it is nothing but Realme C1 that comes with INR 6999. The surprise announcement made by even more surprise including its price and sudden announcement of the C1 smartphone without any hint so far though many aware about Realme 2 Pro prior to its launches. The another achievement Realme has done so far in the shortest period is, it has got one million customers for their gadgets within four months and it is definitely one of the fastest growing mobile phone brand in India. Let us see how their current device and upcoming one goes well in the future. Also, you can buy Realme C1 and Realme 2 Pro smartphones from Flipkart on October 11, 2018 onward. One of the most features packed smartphone Realme 2 Pro detail is available. 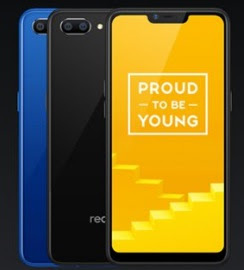 You can check Realme C1 specs, features and price detail below and proceed to purchase accordingly on stated date. We would review this device anytime soon. The phone is powered by Qualcomm's Snapdragon 450 processor and coupled with 2GB of RAM. The internal storage of the phone is of 16GB which memory can be expandable via microSD card. Realme C1 runs with the latest Android Oreo operating system and ready for Pie OS as well. This is one of the cheap and best smartphones available at the moment. The device comes with 13+2 megapixel rear camera and 8 megapixel rear camera. You can check its specs and price detail below. This is budget smartphone from Realme, Oppo's sub-brand. Tips: The above specification phones already came from Oppo, which is A3s, and the brand's own Realme 2. The above subject device has similar specs and features but price is awesome to go with. Realme has launched Realme 2 Pro smartphone on September 27, 2018. The successor to Realme 1 and Realme 2 smartphones. 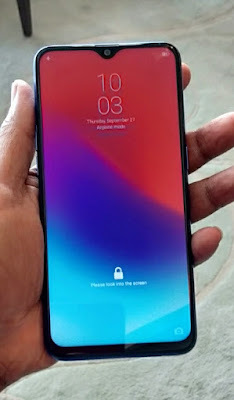 The Oppo's sub-brand has done tremendous job in just four to five months since they had launched their first Realme1 smartphone. Realme has got one million customers so far within Mid-September 2018 and after the sale of Realme 2 smartphone. In the past few weeks, many were eagerly waiting for the Realme 2 Pro mobile phone launches and release date to grab the device. They are aware that the brand would launch Realme 2 Pro with reasonable price with an advanced features in it. As said, the brand hinted few features of Realme 2 Pro prior to its launches which we had mentioned in our earlier post. The features in the gadget is like DewDrop Notch or Tiny Notch, Qualcomm SD660 processor, Color of the device and more. 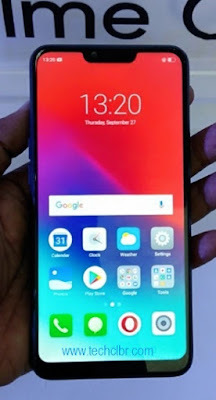 If you are eagerly looking for Realme 2 Pro key features, technical specification, price, first impression, review, comparison and hands-on review etc. then you could find some of them over here. The phone is powered by Qualcomm's Snapdragon 660 processor and paired with 6GB / 8GB of RAM variant. The internals storage has different variants and options. The phone runs with the latest Android Oreo operating system beside Color OS. The gadget comes with 16+2 megapixel rear camera and 16 megapixel front shooter. You can check Realme 2 Pro specs and price detail below. Realme 2 Pro price: INR 13,990 starts. Tips: One of the cheap and best smartphones to buy it. You can buy the smartphone from Flipkart on 11th Oct 2018 onward. Quantum Corp. has announced at IBC 2018 that it unveils the latest version of StorNext®, the media industry’s leading content production and archive storage platform. Quantum also showcase the latest NVMe flash technology, as well as the Xcellis® Scale-out NAS shared storage appliance, which has been named a finalist in the IABM BaM™ Awards 2018 in the Store category. StorNext is designed with new enterprise capabilities focused on improved integration with cloud resources, enhanced data protection functionality, and better support of collaborative environments, the newest version of StorNext will help media organizations worldwide meet increasingly tight production deadlines. NVMe Powered Xcellis Storage Appliances Provide Unparalleled Performance. Leveraging the latest NVMe flash technology, Xcellis storage appliances can now deliver over 17Gb/s single client streaming performance, to support the highest-resolution formats found in digital media with cost effective and all data is accessible by multiple clients in a global namespace. Quantum continues to invest in technologies that make it easier for customers to benefit from modern, feature rich storage solutions. This year the company will showcase its StorageCare® Archive Conversion Service for easier data migration from existing archive environments, such as migrating Oracle DIVArchive content into a StorNext-managed environment. Visit Quantum at IBC 2018 in Amsterdam, Sept. 13-18, Stand 7. B07. Molly Presley, Vice President, Product Management and Global Marketing, Quantum. 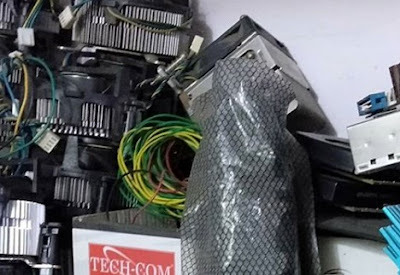 Tips: If you are looking for huge data and media solution then this is one of the best option to opt.